You’ll need to stake your plants once they look like they’re starting to bend toward the ground. Tomato plants can grow pretty quickly, and by now most of you have likely taken this step. I use fairly heavy-duty 2×2 stakes, sharpened at one end. Hammer them into the ground fairly close to the main stem, but not so close as to risk root damage. First, try to lean the tomato plant on the stake in such a way that it’s standing up without being tied. Then use pieces of soft material to secure the plant to the steak in 2 or 3 places along the main stem. Don’t use wire or anyting that will cut into the stem. I use soft twine or old socks or T-shirts torn into strips. Also consider where on the plant you’re tying… left unattended a plant can grow quite a bit in just a few days and a misplaced tie can snap off a good stem as the plant grows. And don’t tie the stem tight to the stake, leave some room. Now that your plant has started to grow, clip off all the suckers, stems and leaves below the first flower/fruit cluster. Keeping leaves off the ground will discourage disease and pests. Check your plant every few days. When you see suckers growing out of the crevices between the main stem and leaf stems, pinch them off. In this image, the bottom two circles show crevice stems that have been pruned away, and the top circle shows one that still needs to be clipped. Beefsteak tomato plants are “indeterminate,” which means they require staking and pruning to grow properly. By contrast, many cherry and grape tomato plants are determinate and grow shorter, more like bushes, and do not require staking and pruning. Never prune your tomato plants after it rains or while they’re still wet from watering. The tomato plant will continually try to grow new main stems out of the crevices between the existing stem and leaf stems. If you let them grow you’ll soon find that you need multiple stakes to keep the plant growing upward, and you’ll have a near-unmanageable mess on your hands. Keep a close eye on your garden and try to prune your tomato plants every few days. Leaving them for too long will make it difficult to know which stem is the true main stem and which needs to be pruned away. And never prune your tomato plants after it rains or while they’re still wet from watering. Humidity and water droplets can allow fungal spores and disease remnants to enter through the open plant wounds. Once the clusters of tomatoes start to grow, pinch off some of the smaller duds. Meaning, if you’ve got a cluster with 5 tomatoes growing, pinch off the 2 smallest ones, or the two that look the least promising. This will help the remaining fruit to grow bigger and faster. 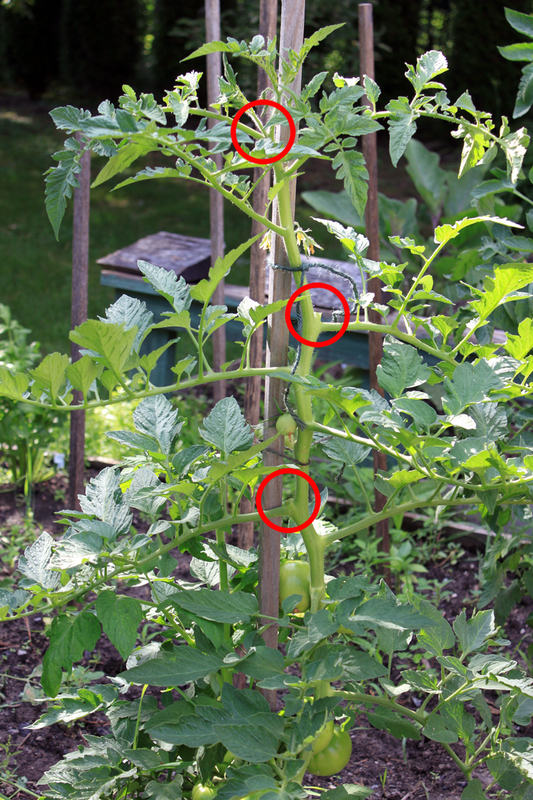 If you maintain your beefsteak tomato plants by adjusting the stake ties and pruning off new attempted main stem suckers, along with regular watering, weeding and fertilizing, they should grow to be 5 or 6 feet tall and produce some fairly large fruit. Thank you, Jose! I’m glad you found the article helpful. Our “beefsteak” posts have been very popular. If you can, let us know how your plants and tomatoes turned out. I apologize for not approving and responding to your comment sooner.